It is to inform all the FYP group of 15CS Batch that the Project Exhibition is to be held on 29 August, 2018. 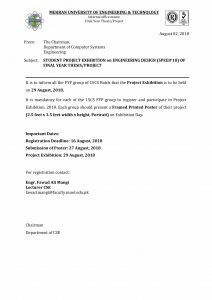 It is mandatory for each of the 15CS FYP group to register and participate in Project Exhibition, 2018. Each group should present a Framed Printed Poster of their project (2.5 feet x 3.5 feet width x height, Portrait) on Exhibition Day.